Before telling kids to show some respect, you need to consider what the word means to them. 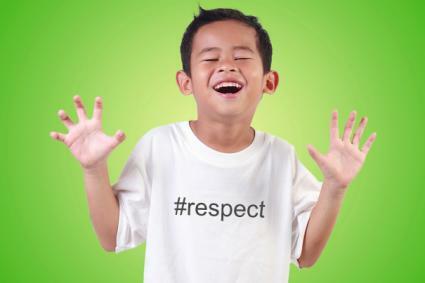 Respect is an abstract noun which covers a range of concepts difficult for children to grasp, so use memorable activities to teach them respect for people, property and the environment. 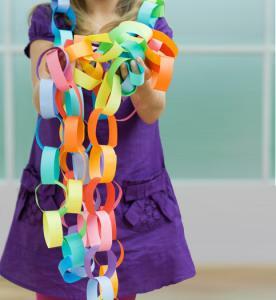 Even young children can link paper chains together. You can do this activity one-on-one, with the whole family or with a class. Discuss the area of respect you want to focus on. For example, you could talk about respect for people's rights and why people stand in line at a grocery store. Ask a related question. This could be something like, "Do people stand in line at school?" followed by, "Do some kids cut in line before you?" Ask the children why they think people behave that way. Help them build on the answer by talking about children's feelings when people don't behave as they should, and how they feel when they make a person happy. Write an example of how you shouldn't behave on a strip of paper. For example, you might write, "Show respect-don't push in the line." Repeat the process focusing on another area of people's rights. When there are enough strips, stick the two ends together to form a ring. Use tape or a glue stick to secure the ring. Demonstrate how to form a chain by passing the next strip through the ring to make a link and repeat. Decide together where to hang the chain. Have fun looping it around the walls and windows where it'll be seen and read. If you're working with small kids, prepare strips of brightly colored paper beforehand and help them write their ideas. Then later, you can make the chain and hang it up for all to see. 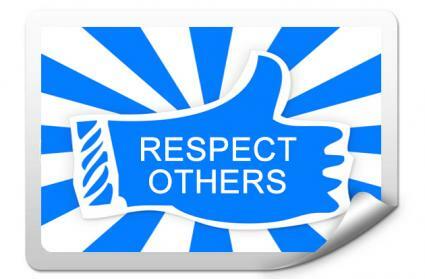 The video All About Respect is useful to give lower middle school children ideas. In a classroom or with a group of middle-school kids, set up tables with children working together and hold a competition for which group makes the longest chain. Kids can choose different areas of behavior for their chains: environment, community, playground or home, for example. Have a size for the links to limit quarrels. Each point must be clearly written and teams are penalized for repetition in their chain. At home, once you've begun the activity, pass the leadership to an older sibling and contribute by prompting from a distance as needed. Speaking about aspects of polite behavior teaches kids what is expected of them so they aren't awkward in social situations. They're proud and reassured when giving correct responses. Writing the points reinforces the information and the hands-on activity is fun and memorable. Finally, displaying their work gives them self-esteem as well as a constant reminder of your discussion. Praise their work to others so they know you respect it. If working at school or on a kids' youth project, you'll need to ask for funding or contact parents to provide t-shirts. Before the activity get the kids into the mood by showing them the Respect Rap Video. Stop the video just before the rap begins and discuss the scenes shown of kids playing football, the school yard and pushing in line. Ask students what they think the rap will be about. Talk about rap lines from the video. Explain what a slogan is. Ask for slogans from the rap. Ask each child to create a design and slogan, and then draw it onto a piece of drawing paper. Let students show their work. Encourage other students in the class to tell what they like about a student's work. Give each child a t-shirt and fabric paints. Tell students to draw their designs onto their t-shirts. Make a point to discuss why they chose their particular slogans. This activity is an excellent project for the whole school. You can have a day where everyone wears the t-shirts they made and hold a parade. Discussion of the video and choosing the slogans that mean the most to the kids points out issues they all share, strengthening a sense of community and enforcing mutual respect. The act of sharing their original ideas and complimenting each other on their work gives self-esteem; kids feel respected by their companions. In addition, wearing their designs is a constant reminder to themselves and other kids that they should show respect. Youngsters can use sticky-backed paper to create colorful stickers for their bags, pads and books. Kids either draw their stickers by hand or look for ideas on the internet. Talk with your students about respect. Use a ruler to measure the area to place the sticker. Draw it on sticky-backed paper. Peel back the paper and stick the design to your bag. This activity reinforces points brought about through discussion. The hands-on element gives time for youngsters to focus on the issues you talked about. Displaying their stickers gives youngsters a sense of pride and provides them with a talking point so they can show off their knowledge when other kids or adults ask about the reasons for their stickers. This activity is for ages nine to twelve years and teaches children to observe scenes where people have respected or disrespected their immediate environment. You can do it any time of the year, but it's especially valuable in the period prior to Earth Day. 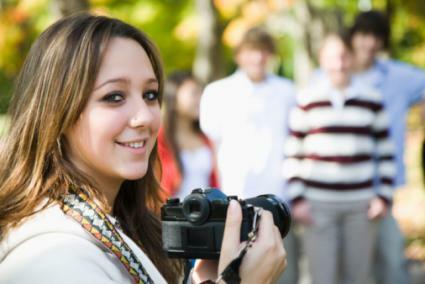 Give kids a week to take photographs that show disrespect or respect for the community. Discuss why the child took the photo and what it shows. Kids write 'Respect' in the center of a large piece of project board. Kids create a montage of their photos. Youngsters stick the photos to the project board. Kids attach stickers to each photo, positive, negative, happy or sad, to indicate whether the image shows respect or disrespect. Kids write statements about why they took the photos on labels and stick the labels beside their photos. Children ages six to nine years can cut out pictures from magazines for their montage. Display the montage in a prominent position. Consider getting the whole school to exhibit on the same theme. This activity prompts kids to concentrate on their environment and take note of the pleasant and unpleasant aspects. They realize for themselves that disrespecting their surroundings causes ugliness. When you print out and mount a display, they get the chance to discuss the pictures and admire each other's work. By exhibiting. you give it a proper amount of respect and allow the discussion to pass into the wider community. 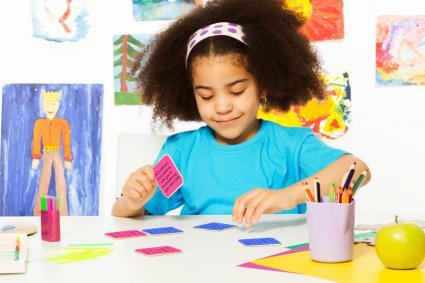 Kids make a set of cards and play card games, either alone or with other children. This activity is for youngsters between the ages of six and nine years. Divide the pink sheets of paper into sections the size of a playing card. In each section write a situation. For example, you might write, "What do you do when you have a friend over and there is only one cookie left in the jar?" Divide the blue sheets of paper into sections the size of a playing card. In each section write a respectful behavior for the situations. An example of a solution would be, "You offer him the last cookie." Spread out the solution cards in the same way. Each player turns over a situation and a solution card. If the situation and solution match, the student claims the pair. The player with the most pairs wins the game. The game can be played alone with the child matching the cards or with a friend. Why they think the solution matches the situation. If they can think of a different solution and talk about it. How they would feel if the person acted differently. For younger children, make the cards yourself. Older kids can think up situations and solutions. Make a third set of cards which require more diverse solutions. Divide the kids into teams. Get them to think of situation cards to make. The opposing team has to find solutions. 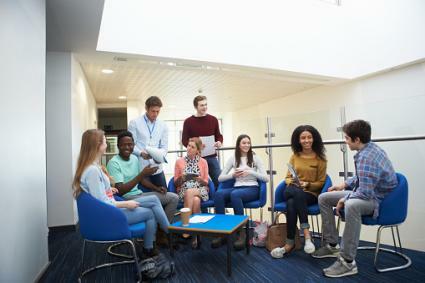 At a basic level, this activity helps teach appropriate social response and the motives for behaving with respect towards people and property. For older kids, it is important in revealing alternative behavior and teaches them to consider other people's feelings. Encourage them to make up games and regularly extend the points on the cards so situations and solutions are varied and thought-provoking. With each stage of these activities be sure to ask your kids' opinion on the reasons they should behave with respect. It's not enough they toe the line; they need to understand why showing respect is important, otherwise you're just teaching polite behavior. The activities are reinforcing the lessons learned during the discussion. Follow these tips for effective discussion. With younger students, the questions and situations you talk about should be simplistic, but for older kids go into more detail. With each situation, when your student supplies an answer you need to ask, "Why do you think we do that? How would you feel if he didn't do that?" and "What if someone did that to you?" With older children, relate your scenario to behaviors. The more detailed your dialogue, the more effective it will be. When talking about respect for property or the environment, the same concept is applied. Ask how students would feel if the equipment on the playground was broken, if there were no trees in the park, etc. Kids are copycats and learn through mimicry. If you want to teach your students respect, you have to provide an example for them to imitate. Through teaching them to treat others as they would like to be treated themselves, and backing it up with activities they'll remember, you help students learn a respectful attitude to people, their community and the environment in which they live.